Agnete Hoy globe vase - 3¾" (95 mm) high, 4¾" (120 mm) diameter. Agnete Hoy (sometimes called Anita) was born in 1914. She studied at Copenhagen College of Arts and Crafts from 1933 to 1936. In 1939 she came to the United Kingdom for a holiday, but due to the outbreak of World War II, was unable to return. She remained in Britain until her death. 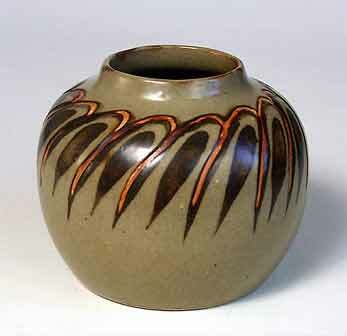 Much of her work was as a designer/potter for companies such as Bullers and Doulton. Bullers Ltd operated from 1937 to the mid-1950s near Hanley, Staffordshire. They chiefly manufactured industrial pottery, but also decorative wares. Anne Potts, James Rushton and Agnete Hoy were among their designers.